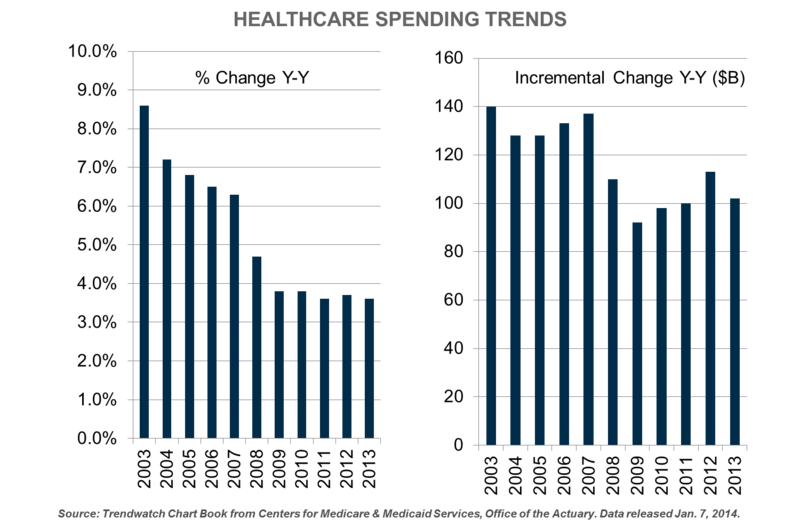 Is Healthcare Spending Really Dropping? Healthcare is a $3 trillion industry with significant variation in local market demographics and socio-economics, care-delivery fragmentation, efficiency and effectiveness, as well as competitive intensity. Alvarez & Marsal (A&M)’s analysis suggests that the growing local market power of hospital-led health systems and insurance companies is “squeezing” downstream costs without necessarily enhancing clinical outcomes or operational efficiencies on a commensurate level. The messaging of reform far exceeds the reality of change. This article seeks to provide supporting evidence to our hypothesis. National health spending in 2013 increased 3.6 percent, consistent with growth rates seen since the onset of the “Great Recession” in 2008.3 Expenditures of $2.9 trillion represent 17.4 percent of the national GDP. A&M believes the high rate of baseline spending, combined with annual incremental outlays of $102 billion, is a better indicator of embedded care delivery inefficiency and ineffectiveness than the less imposing annual percent change. 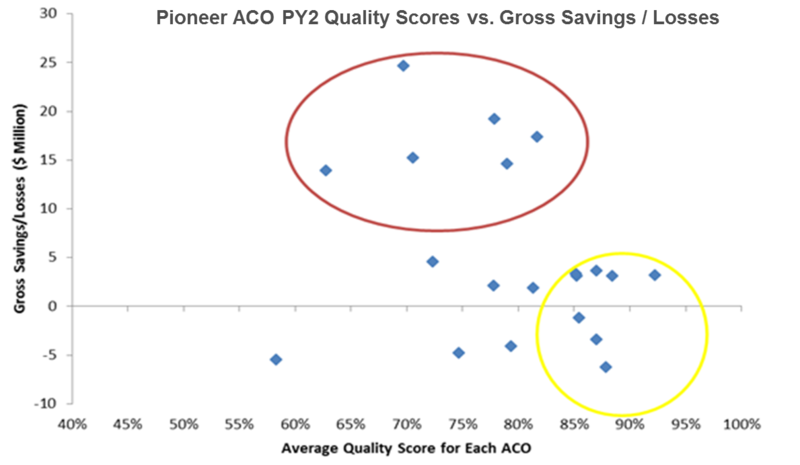 Year 2 results also highlighted improved quality scores for ACO participants relative to their FFS peers; 14 of 23 (61 percent) had lower costs, but only 11 of 23 (48 percent) had sufficiently lowered costs to generate shared savings. Four ACOs dropped out after or during Year 2. According to a Brooking Institute analysis, the average per capita Medicare spending in the metropolitan area of those ACOs in the red circle (higher savings, average quality scores) was $11,544 — significantly above the average Pioneer ACO county of $10,384.5 The data suggest that higher levels of baseline spending (reflective of local market provider inefficiency or ineffectiveness) may be more important than actual performance to generate shared savings. SL Kocot, R White, P Katikaneni, M. McClellan; 10/13/14. Healthcare consolidation is increasing across all sectors, thereby highlighting the potential for oligopolistic pricing. For example, in 2011–2013, there were 285 announced merger and acquisition deals involving 683 hospitals, an increase of 55 percent of deals as compared to 2008-2010 when there were 184 deals involving 283 hospitals. 6 The HMA - Community Health Systems (CYH) announcement alone involved 206 hospitals. However, unlike the HMA-CYH, not all announced deals actually close. Inpatient services: Acute inpatient hospital admissions fell 2.3 percent, while prices rose 6.7 percent, causing overall inpatient spending to rise by 3.8 percent. The average price per-admission grew by $1,067, in 2013 to $18,030. Outpatient services: Outpatient visits declined by 0.8 percent, while prices rose 6.4 percent. Total outpatient visit spending grew 5.5 percent. The commercial payer price increases are being masked by media focus on overall growth rates subject to changes in payer mix, limited Medicare and Medicaid reimbursement growth and declining to flat utilization. Spending growth in physician and clinical services declined from 4.3 percent (price: 1.0 percent, volume: 3.3 percent) in September 2011 through September 2012 to 4.0 percent (price: -0.2 percent, volume: 4.2 percent) in 2012-13 and 2.1 percent (price: 0.8 percent, volume: 1.3 percent) in 2013-2014.9 Physicians, especially those in primary care and related specialties, remain critical to enhanced management of chronic conditions and diseases, as well as to the influx of newly covered Medicaid patients. Declining morale, combined with accelerated retirements, will exacerbate the already forecasted shortages of primary care physicians. Three-quarters of Medicaid and 28 percent of Medicare beneficiaries are enrolled in Managed Care.13 Plan participation allows government agencies to transfer risk and better estimate annual costs. However, managing financial risk does not imply care delivery efficiency and effectiveness. A recent investigation by the Health and Human Services Inspector General discovered that 48 percent of providers listed as serving Medicaid patients were either inaccurately listed, or did not accept Medicaid or new Medicaid patients. Appointment wait times were also excessive.14 Selection bias, contract exclusions, restricted access and utilization constraints are often used to maximize plan profitability. Wellpoint’s acquisition of AmeriGroup in July 2012 signaled the financial benefits to be accrued from Medicaid expansion.15 The number of Medicare Advantage plans has declined from 2,830 in 2009 to 2,014 in 2014.16 Dual-eligible interest among insurers is rising due to the high level of spending associated with the lack of care coordination and co-morbidity management, and an excess of institutionalization. Higher out-of-pocket costs are affecting the overall utilization of health services. Approximately 30 percent of consumers have deferred visiting a physician, undergoing a test, filling a prescription or complying with treatment due to economic reasons.19 In one-third of cases, the consumer believes treatment was delayed for a serious condition.19 Worse outcomes and higher costs in these patients are likely to ensue as preventable or reversible conditions progress to more severe forms. The net cost impact due to deferral is likely higher due to the concentration of costs among those that are most ill.
Short-term stabilization of national health expenditures does not signify transformational change in care delivery. Nor does it imply a sustainable moderation in costs. The Medicare ACO data appears paradoxical. Less efficient and effective providers generate greater savings in high-cost markets — as compared to more efficient and effective providers with many years of experience focused on the care continuum and reducing costs. Opportunities may exist for a number of the Pioneer ACOs (and others) to extend their geographic reach into contiguous areas of relative inefficiency. 2 White House Blog; Council of Economic Advisers; Dec. 3, 2014. 4 The Advisory Board Company Daily Briefing. Nine ACOs Are Leaving the Pioneer ACO Program; July 16, 2013. 5 Brookings Up Front. A More Complete Picture of Pioneer ACO Results; Oct. 13, 2014. 6 Irving Levin Associates, Inc. The Healthcare Acquisition Report, 20th Edition, 2014. 7 AHA Trendwatch Chart Book, 2014. Chart 4.6. 8 Healthcare Cost Institute. Spending Per Privately Insured Grew 3.9% in 2013, as Falling Utilization Offset Rising Prices; Oct. 28, 2014. 9 Center for Sustainable Health Spending, Altarum Institute. Health Care Price Growth Settles Into Narrow Range at Low Rate. Price Brief #14-11; Nov. 12, 2014. 10 AMA. Physician Characteristics and Distribution in the U.S. 2015 Edition. 11 Beckers Hospital Review. Survey: Number of Employed Physicians Up 6%; June 18, 2013. 12 Filling the Void: 2013 Physician Outlook and Practice Trends. Jackson Healthcare. 13 AHA Trendwatch Chart Book, 2014. Charts 1.23 and 1.25. 14 New York Times. Half of Doctors Listed as Serving Medicaid Patients Are Unavailable, Investigation Finds; December 8, 2014. 15 AMED News. Acquisition may be first wave of Medicaid managed care consolidations; July 30, 2012. 16 Kaiser Family Foundation; Medicare Advantage 2014 Spotlight. 17 Kaiser Family Foundation; 2014 Employer Health Benefits Survey. 18 AHIP Center for Policy & Research. Jan. 2014 Census Shows 17.4 Million Enrollees in Health Savings Account— Eligible High Deductible Health Plans (HSA/HDHPs). 19Costs Still Keep 30% of Americans From Getting Treatment: Lower Income and Younger Adults Most Likely to Have Delayed Treatment. 20 Christina LaMontagne. NerdWallet Health finds Medical Bankruptcy accounts for majority of personal bankruptcies; Mar. 26, 2014. 21 AHA Trendwatch Chart Book, 2014. Chart 1.27 Annual Change in Health Insurance Premiums, 2000-2013. 23 AHIP Center for Policy and Research. Issue Brief: Specialy Drugs – Issues and Challenges; Feb. 2014 23 Express Scripts Insights. Specialty Drug prices to Increase 67% by 2015; May 22, 2013. 24 Center for Sustainable Health Spending, Altarum Institute. Health Spending Continues Moderate Growth Through Third Quarter. Spending Brief #14-11; Nov. 12, 2014.